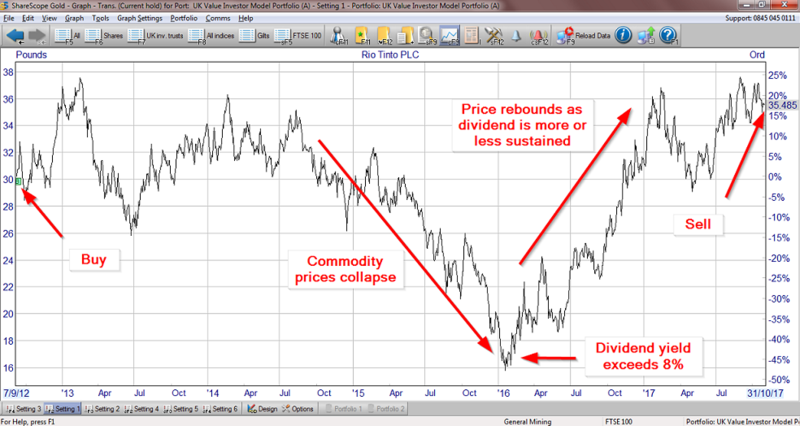 In this blog post I review my decision to buy Rio Tinto shares in 2012, and my decision to sell them last week. Rio Tinto was a volatile investment with some extreme ups and downs, but when I eventually sold its shares the returns were okay. The investment also rammed home the importance of buying highly cyclical companies at extremely low valuations, which is something I recently learned from my investment in Braemar Shipping. Back in 2012, Rio Tinto had all the qualities I like to see. It had high and consistent growth, a long and unbroken track record of dividend payments and little in the way of debt. The share price was also reasonable, as was the dividend yield. First, the company had made a massive acquisition in 2007. The acquisition was paid for with huge amounts of debt which subsequently had to be paid off by raising cash from shareholders through a rights issue. Second, Rio Tinto was a miner, and miners are highly cyclical. I, on the other hand, am a defensive value investor. At the time, I thought these problems were not particularly serious. I also though an investment in Rio Tinto could teach me more about miners whilst potentially making a reasonable return. In the end it did more of the former than the latter, but I still think it was a worthwhile investment. An 8.4% annualised return isn’t particularly brilliant, but it isn’t a disaster either. And as I’ve mentioned, there were important lessons learned, which I’ll get to in a minute. The late 2000’s were a time when Rio Tinto was riding high on the back of the commodity super-cycle, much like Braemar Shipping which left my portfolio a couple of months ago. In fact, when Rio Tinto joined the portfolio is was pretty much at the absolute peak, although of course I didn’t know that at the time. Steady growth or cyclical boom? As the chart above shows, Rio’s growth over the previous decade was astonishing. Its annual growth rate over that period was 21%, averaged across revenues, earnings and dividends, but even that fails to capture the true pace of its expansion. Annual revenue growth was close to 30% and annual earnings growth wasn’t far behind at 25% per year. Those are seriously jaw-dropping figures. However, when I reviewed the company in 2012 I was well-aware that such rapid growth was not sustainable. Instead, it represented only the boom phase of Rio Tinto’s business cycle, in this case perhaps the biggest commodities boom in history. Despite this rapid growth, the company’s valuation ratios were relatively low, partly because investors were worried about a slowdown in China and its impact on commodity prices. As you can see from the table below, in 2012 Rio Tinto’s combination of growth and value metrics were, for the most part, much more attractive than the market index. From a purely quantitative point of view, the numbers stacked up. But as I’ve already mentioned, there were some problems. The first was the 2007 acquisition of Alcan, a large Canadian supplier of Aluminium. This was a very large acquisition, paid for with enough debt to take Rio’s debt ratio to 9, more than double my preferred maximum for cyclical companies of 4. To me this shows a willingness by management to take on an unacceptable level of risk in the pursuit of rapid growth. Today, this would place a serious question mark over whether I would buy such a company, but in 2012 I was much less experienced and much more forgiving. The second problem was that Rio Tinto is highly cyclical while my approach is to look for relatively defensive companies. In a nutshell, my investment strategy is not well-suited to analysing highly cyclical stocks. Still, I chose to invest in Rio because I wanted to learn from the experience, to improve my strategy and yes, to hopefully make some money as well. After I bought the shares in September 2012, it didn’t take long for things to start going wrong. By January 2013, Rio Tinto was announcing asset write-downs of 14 billion dollars and the replacement of the CEO, mostly in relation to the previously mentioned acquisition (summary: the company massively overpaid at the peak of the cycle, which is precisely why I don’t like large acquisitions). Oddly enough, I think this disaster was good for the company, at least in the long-term. The new CEO appeared to be much more focused on squeezing maximum cash out of the company’s existing mining assets, rather than simply looking to expand its assets by acquisition or capital expenditure. The company’s 2013 annual results were a mixed bag, with revenues and dividends going up as profits went down. It was, in effect, the calm before the storm. And let’s be clear – This was not a storm of Rio Tinto’s making. As a miner of commodities, Rio is like a supertanker crossing the Atlantic ocean. Massive storms are simply an unavoidable part of its business. In this case, the storm was the ending of the commodity super-cycle. In terms of prices, the commodity super-cycle started to decline in 2008, during the financial crisis. But even after the crisis, China continued to build what seemed like a new city every other day, so demand for all sorts of commodities like coal and aluminium was outstripping supply. But by 2013 that supply/demand imbalance was turning around. China’s breakneck pace of development slowed, and following years of strenuous effort and heavy investment from miners and other commodity extractors, supply eventually exceeded demand. And that, of course, had a negative impact on commodity prices which was very bad news for miners like Rio Tinto. Although the company’s efforts to reduce costs, reduce capex and increase cash flows managed to offset falling prices in 2013, further commodity price declines in 2014 were just too much to absorb. The result was falling revenues and a steep decline in earnings. Ever the optimists, Rio Tinto’s board decided not only to raise the dividend but to also begin a 20 billion dollar share buyback program. This may seem foolish, but the company’s debts were not excessive and returning cash to shareholders may well have been the sensible thing to do. By the end of 2015, commodity prices had more or less hit rock bottom and, as you might expect, so had Rio Tinto’s revenues and earnings. In just a few short years the company’s ten-year track record had changed completely. 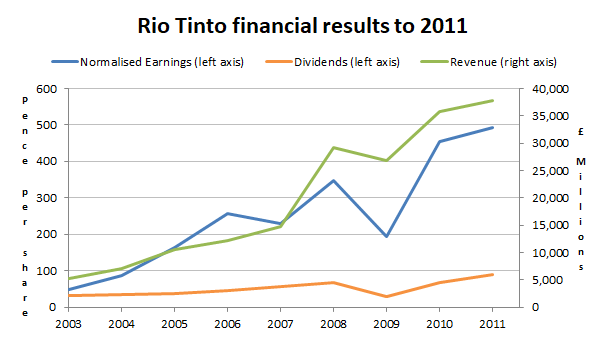 In 2011, Rio Tinto’s track record showed nothing but incredibly rapid growth. By 2017, it showed almost nothing except rapid decline. This sort of boom to bust story is, of course, what you should expect from highly cyclical companies and I don’t think these results reflect badly on Rio Tinto at all. More recently, commodity prices have stabilised. The problem is they’ve mostly stabilised at very low levels. 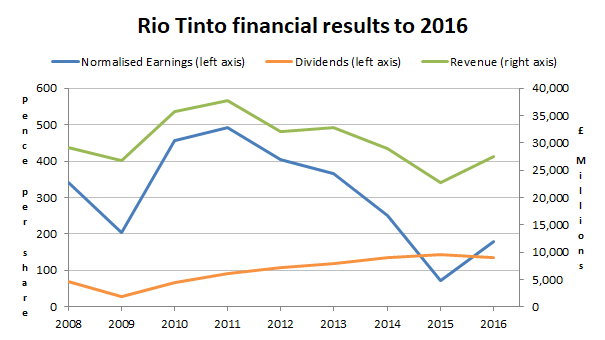 Despite this headwind, Rio Tinto managed to increase revenues and earnings in 2016. Perhaps more importantly, the dividend was only cut very slightly which has helped the share price to recover dramatically. Commodity prices are still generally very low and it seems as if we’re still close to the bottom of Rio Tinto’s cycle. Surely this is a bad time to sell a mining company, when commodity prices and mining company valuations are depressed? It could well be. However, I have a well-developed investment strategy and I intend to stick to it. I don’t want to start making ad-hoc investment decisions, such as hanging onto Rio Tinto, when my stock screen and portfolio management rules are telling me to get rid of it. So as with every stock I sell, Rio is being sold primarily because it has one of the lowest stock screen ranks of any holding in the portfolio. As far as the stock screen is concerned, Rio Tinto is a slow growth company at a middling valuation, which is not a particularly attractive combination. Of course, we humans are much smarter than a stock screen and we know that Rio’s current growth rate of 1% is probably temporary. When the commodity cycle turns upwards, Rio Tinto’s growth rate will probably turn upwards as well. But I have no idea whether the commodity cycle will turn a year from now or ten years from now. For me, having an opinion about where commodity prices will go is pure speculation, and speculation is something I try hard to avoid. I would rather stick to Plan A, which is to trust the stock screen and not my opinions about commodity prices. However, the stock screen is not perfect and one of the reasons I invested in Rio Tinto was to learn about highly cyclical companies, and learn I have. I have learned that Rio Tinto is a good but highly cyclical company and that my stock screen is not very good at valuing highly cyclical companies. The stock screen overestimated how attractive Rio was in 2012 and it is probably underestimating how attractive Rio is today. This is not a satisfactory state of affairs, so something needs to change. My circle of competence is defensive value investing; finding relatively defensive companies and buying them at attractive valuations. Highly cyclical companies like Rio Tinto do not fit that description and so they sit outside my circle of competence. Avoiding all commodity-related sectors is therefore a reasonable choice. But there is an intermediate step, which is to only buy them when their valuations are at absolute rock-bottom levels. Only buying mining companies (and other commodity-related companies) at extremely low valuations should improve the odds that I’ll buy them towards the bottom of the cycle rather than near the top. PE10 and PD10 are basically price relative to ten-year average earnings or dividends. Anything above 30 and 60 respectively is unlikely to be attractively valued in my experience, no matter how wonderful the company. However, a PE10 ratio of 30 and a PD10 ratio of 60 are not rock-bottom valuations. They are in fact quite generous limits because many of the companies I invest in are high quality steady growth companies. These are companies like Reckitt Benckiser, which command reasonably high valuation ratios even when they’re attractively valued. But mining companies are not steady growth companies. Instead, boom is typically followed by bust, and I want to buy them during the bust, not the boom. Those valuation limits are just one third of my standard maximums and I think they could reasonably be described as “rock bottom”. Having such strict rules on valuation will be limiting of course, and I expect my future investments in commodity stocks to be few and far between. But when I do invest in them, I’m hoping for much better results, and in the case of Rio Tinto, its share price has more than doubled since falling below those rock-bottom valuations in early 2016. So buying Rio Tinto at rock-bottom prices in 2016 would have been a very profitable move, and hopefully that’s something I can pull off next time around. John – Interesting, I came to the same conclusion on both Rio Tinto and Glencore. I sold Rio at 3601 on 23Oct17 having bought on 10Aug15 at 2552 — for a 41% capital gain + divs. Glencore a little less successful, but happy to be out after what was at one point a 80% loss — sold for 33% gain plus some dividends, but even these were suspended during the low lean period. I would reinvest, but only in dire circumstances and I’d probably avoid Glencore because of it’s remote and perhaps in many cases unmanageable regions and stick to RIO which will I believe always be better capitalised than Glencore. On another note I also sold 1/2 of my sizeable holding in Burberry after Bailey resigned. You will have noted the strategic announcement made yesterday by the new CEO Gobbetti. The strategy he named looks exactly like the one that killed Mulberry in it’s naieve attempt to outprice the middle market faithful followers of the brand. I bought some back at the 13% drop yesterday, but feel now that with a 70% gain in hand I will offload the rest as the capital spend and the shuttering of the store outlets in the US and EMEA seems to me like a big mistake. – could be wrong of course, but a bird in the hand as they say is better than a Mulberry Bush — or is it a Burberry Blush — I’m getting confused lol !! LR — WPP still looks cheap though — but no rush to big up on my 1% holding, as the whole market looks nervous right now and any announcement or trading statement from any company, good or bad, is met with a large sell off. On Burberry, I have no idea how their new strategy will pan out, but the resignation of Bailey was interesting. He was instrumental in their post-baseball cap turnaround, but now that their new “look” is established it will be interesting to see if A.N.Other designer can keep the ball rolling. Well, my wife will not be stunned to know that I’ve never heard of Phoebe Philo, or pretty much any other fashion designer! Just noticed on your site that your free blog newsletter sign-up form has disappeared. Has the free email been scrapped? I hope it hasn’t. Hi Maynard, it’s just morphed into the “free guides and tools” offer at the top of the right sidebar. I guess it’s not entirely obvious that’s also the place to subscribe to the blog. Hmmm… I’ll have to fix that. Commodities are a wonderful diversifier, dancing to a different tune to the main indices. So this investor holds Commodity Income indefinitely, top-slicing and bottom fillling through the ongoing cycles, ideally when the main indices are in a different part of cycle (i.e. out of phase). From a long-term value perspective, still see some upside unlike most Assets today, and note the building recovery momentum in Commodities. Nevertheless good situation to take some money off the table. But this investor would be struggling to find a suitable replacement. Look forward to the next buy with great interest. Hi Magneto, yes definitely agree that commodity stocks are usually quite uncorrelated to the rest of the market, and their rebound has certainly helped my portfolio in recent months. I just need to work on getting in at a more attractive price next time around. As for commodity-related replacements, I don’t see anything that’s attractively valued at the moment, so I expect to my commodity exposure to be shrinking for the foreseeable future. I’ve sold off a number of oil/mining shares over the last few months with only Rio, BHP, Shell, Weir and Petrofac remaining. Since the summer I’ve offloaded Newmont Mining Corp, BP and Antofagasta (ANTO sold today) giving me nice returns – I was lucky enough to buy most of these shares in and around the bottom when I went commodities shopping what with all the bad news and grim prices, but I bought Petrofac quite early so I’m sitting on a loss there. Think I’ll be wanting to cash in on Weir soon too. I guess me not offloading Rio just yet is betting on the effects of China cutting back on local iron ore production (pollution and low-grade ore). They’ve made a big effort to sweat their existing assets and cutting costs while increasing iron ore supply to subdue prices and squeeze out the smaller players. Then there is the Chinese One Belt One Road program with it’s massive infrastructure investment over the upcoming years. I feel these guys have just got through to the other side, are now stronger and positioned to ride the next (though probably not quite as big this time) wave. Or not and I’ll be cursing myself for not following your lead! Hi Andrew, I’m a bit like you in that I have a gaggle of commodity-related holdings which are lined up near the exit. I’ve already offloaded Braemar Shipping and now Rio Tinto, and BP and BHP Billiton are not far behind. I have no firm views on China, so at least I don’t have that to worry about! I made quite similar experiences, investing in mining companies is tricky. I acquired some stocks of Rio Tinto and BHP in December 2015 when commidity prices had already slumped quite a bit, but hindsight, I entered too early. Performance so far is not bad and most importantly I see these companies in a much stronger position today than a few years ago. They are deleveraging, throwing off plenty of cash for dividends and share repurchase. So I will stick to these holdings but I have it similar to you: the backbone of my portfolio is built on consumer staples and Pharma such as Nestle, Unilever, ReckitBenkisser, Henkel, Imperial Brands, Roche, Novartis, Bayer, GSK. Commodity stocks are definitely a specialist subject. As for the “backbone” concept, that’s an interesting one. I don’t actually think my portfolio has a “backbone” of stocks, in terms of one particular type. All of my holdings have consistent records of dividend payments and non-excessive debts, but other than that they’re a pretty diverse bunch, covering engineering, utilities, insurers, media, fast food, telecoms and much more. But I know what you mean and on the whole they’re far less volatile than commodity stocks, thankfully.